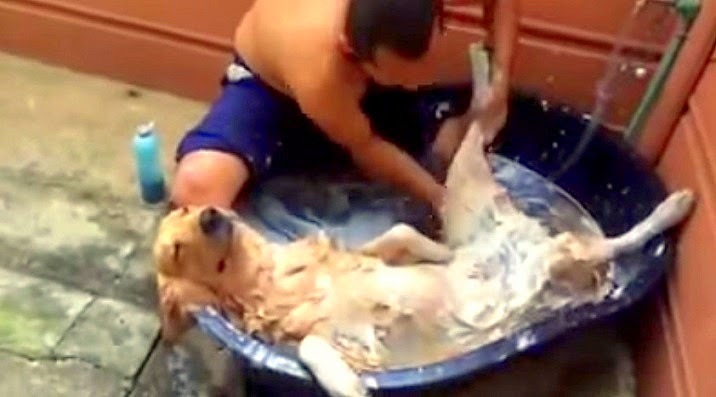 No One Loves Spa Treatments as Much as This Dog! So maybe your dog isn’t one of the ones who absolutely hates bath time, but do they absolutely love it? That guy he’s Thai and his 2 dogs’ name Hashi and CK. These dogs love to play the water by jump into the bath tub, when a the hot weather come they always going to soak (Thailand is always hot about 35-38 degree celsius in the day time) and they like to lay down for abdominal massage. NOTE: In general, puppies don't need to be bathed unless they're visibly dirty or smelly. Puppies -- and older dogs -- need the natural oils in their fur to keep their coats and skin healthy. Most dog shampoos are for dogs around 3 months old or older, but you can still bathe younger puppies if need be. Responses to " Adorable Dog Just Loves Taking a Bath (VIDEO)"
I only dream of a dog this chilled. Catahoula owner here. When you own a Catahoula you always know you have a dog. Heck if someone would put on relaxing Thai music and put me in a tub and would belly rub and scrub I would be chill too.